We are very busy making plans for the memorial day week end as I am sure many of you are, so I am really excited to see and enjoy all the wonderful food that you are sharing today. We are here on the Up Stairs Patio today we can enjoy our time together and watch all the birds when they come to the feeders and the bird bath. We have been helping to put up flags around our community as a reminder what this holiday is all about. I shared a recipe for Cultured Apple Sauce and an article article comparing lacto-fermentation with canning. I shared my MIL's recipe for Navajo Tacos! Nobody ever wanted to miss out on that meal! Thank you for hosting. Thanks for hosting. I shared my recipe for a quick and easy make ahead lunch - chicken croquettes. Good morning, Miz Helen! I've brought a plate of meatballs pasta to share! Thank you for hosting, have a nice day! Hi Miz Helen! I'm sharing my Drunken Shrimp Kabobs this week. Thanks for hosting and have a great holiday weekend! Hi Miz Helen, this week I'm sharing my Curried Golden Beet Soup and announcing my Summer Salad Sundays link-up carnival that will run over summer instead of Sunday Night Soup Night. Thanks for hosting! Thanks once again for hosting Miz Helen! Today I bring my asparagus salad! Have a great day! I enjoyed reading your memories of the "fill your plate" days. What a wonderful idea and now you are carrying it forward with us today. Thank you for hosting Full Plate Thursday. I hope you have a wonderful Memorial Day weekend. I've brought Homemade Ketchup today. Thanks for hosting! It is fun to see all the summer foods! I left my recipes for Honey mustard chicken. Very easy, very tasty. Does it get better than that? Thank you for the party and have a wonderful Memorial Day weekend. Say hi to the birdies on your porch. Thanks for hosting Miz Helen! Everything looks yummy, as usual :) Hope you have a wonderful Memorial Day weekend! Thanks for hosting! You should try some of my strawberry Pretzel salad while you watch the birds from your patio. Haave a great Memorial Day weekend! Hi Miz Helen, I checked out those crock pot potatoes and they look soooo good. I'm sharing a quiche and Pizzelles today. Thanks for hosting and have a great week. Our neighborhood has flags flying, and they are a wonderful reminder of what Memorial Day is all about. Thanks goes to the local Rotary Club for making it happen. I’m sharing some yummy Sprouted Flour Crepes w/ Strawberry Rhubarb Compote, an article on 5 Fool Proof Ways To Fall Off The Whole Food Bandwagon, and a video on How to Make Maple Balsamic Reduction. This stuff is amazing on pretty much everything. Thanks so much for giving me a Red Plate Miz Helen! I am so honored and truly love reading through the other links. I always find something interesting, something I didn't know, or something that I have to try immediately. Thanks for hosting such a fun linky. What a lovely Memorial Day Tribute, Miz Helen! We owe so much gratitude to military families. This week I have shared a delicious Banana Date Cake with Walnut and Honey Glaze. Thank you so much for hosting. Thanks so much for hosting Miz Helen! I hope you have a fabulous holiday weekend! Thank you so much for featuring my Coffee Ice Cream Miz Helen! I think it was accidentally submitted again today as I was trying to check a glitch on my end...sorry about that! Have a fabulous long weekend! Good Evening Miz Helen! This week I brought som grain free sultana scones for Afternoon Tea! We linked up a wonderful shrimp pita for the party. Great recipes again today. Hope you have a great weekend. this week I’ve linked 2 posts. One mine, one a seasonal guest post! 2. Stacy @ Seattle Seedling has stopped by and offered us her rhubarb oatmeal – breakfast? Lunch? Dinner? Snacks? I’ll take it! So many good things ~ I'm starving! Thanks so much for hosting. Hi Helen1 Thank you featuring my recipe for the nacho cheese sauce! this week i brought an easy pantry ingredient fish dish my whole family will eat and some creative lunch ideas w/ Lunch on a Stick! So this week Haydn and I blog a recipe from another blog or cookbook - I chose to do that but not. Instead I asked "where does inspiration come from?".... a few hours later I had to then reflect, "where did all the rum go?"... oops! Summer-ish Strawberry Mojitos baby! Thank you for hosting. I see some wonderful links this week. I've linked my recipe for Roasted Asparagus and Butter Crumbed Eggs. This simple but beautiful dish makes a perfect brunch or a delicious Meatless Monday main dish. Enjoy! Miz Helen, thank you so much for filling your plate with my honeydew ice! I appreciate it so much. This week I've added my Rhubarb Ginger Bars to the party. Thank you for hosting and i hope you have a great holiday weekend! Hello Miz Helen! Thank you for featuring my Handmade Vanilla Cappuccino! 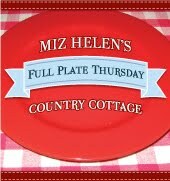 I didn't get a new post out this week but I'm looking forward to linking up next week on Full Plate Thursdays. :) Have a blessed Memorial Day weekend! Thanks for hosting, Miz Helen! Hope your graduation celebration was wonderful last week and that you will enjoy your Memorial Day weekend! Hello Miz Helen...I think this is the first time I've been here and I'm just charmed by your blog. It is delightful. And I love how you have put your Linky party together. Those menu items above that you've chosen sound mighty good and I sure want to try them all...but then I think my waistline would just get bigger than it is...smile. I am following you now so will be seeing you often. And I'm so looking forward to that! Do try the Party Potato chips...they are to die for I promise. You won't be able to eat just one. PS When we were first married and still in college and having babies a couple of the other poor married gals and I would do the same thing. Sometimes we would just trade ingredients. I so well remember those days. So much fun and so many wonderful memories....and good recipes that came out of that. PSS We lived in Austin for nearly 22 years and raised our kids there. And our son and his family still lives in McKinney. We get back down that way once or twice a year. We still consider ourselves Texans. We loved it there!!! Summer is here and it's a perfect time for tabouli. Oh my gosh, I can't believe I almost missed this. Thanks for hosting Helen! I've been experimenting with radish tops and I'm sharing two soups that I put together this past week. Have a great weekend! Finn says "Woof!" Happy Memorial Day Miz Helen! I hope you love the sammy and salad I brought this week! Perfect for a picnic!